Do You have paintings or other artwork and values, that You need transported? Himmerland Movers has the equipment and the expertise, which makes us able to handle any art transportation, in the most careful manner as possible. We know that works of art, can represent a considerably high value, but also a historical- or sentimaltal value. Therefor, we handle artworks with extra care and caution. 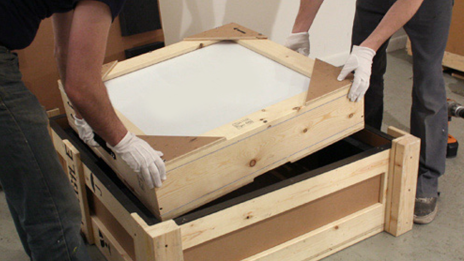 Before transportation, the items are carefully stored in protective casing, and fixated to stabilize them during transportation. We are furthermore members of both The Danish Movers Association and FEDEMAC European Movers, which both has comprehensive lists of demands for our employees, equipment, insurance etc.- so in case of any damage, we are naturally covered by a indemnity insurance. Contact us on Tel. +45 98 62 47 00 or info@himmerlandsflyt.dk to hear more about Your options and get a price quote.